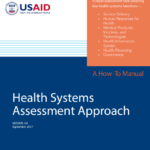 The Health Systems Assessment Approach: A How-To Manual (HSAA) was first published in 2007 by USAID and has been used in more than 30 countries. This webinar introduced Version 3.0 of the publication. Presentation and discussion revolved around: What’s new?, What is the HSAA method and how does it add value? How and where has the HSAA been used? How can the HSAA address community health?